Sorry for the slower blog traffic of late – it doesn’t mean we haven’t been busy!!! We would like to update you on a range of projects over the next couple of weeks. 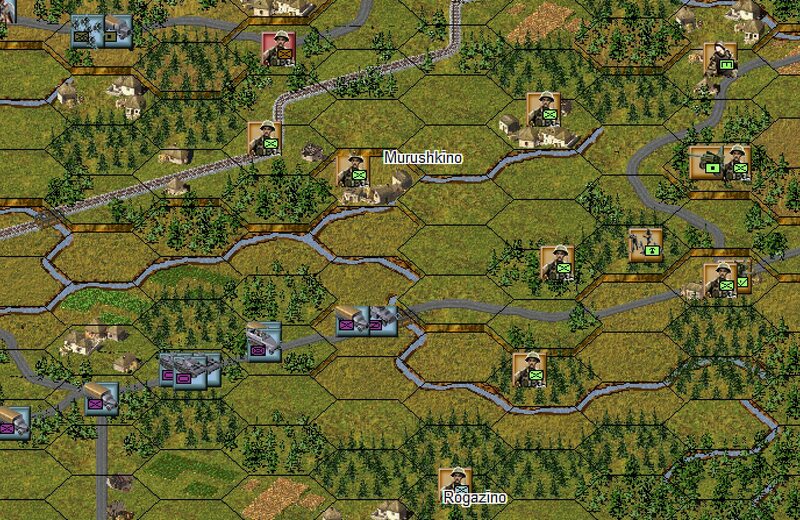 This week’s blog will cover off the Panzer Campaigns series of games, the next post will update you on Panzer Battles and the final one will include a significant announcement. 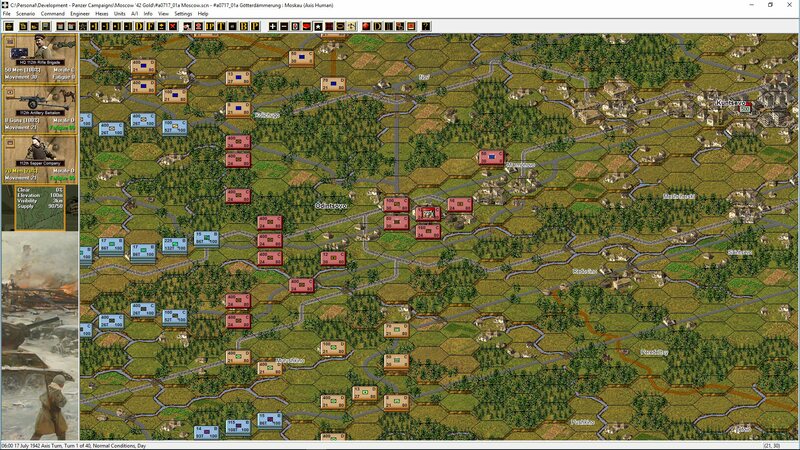 As can be seen, the series to date have covered many of the iconic battles from World War 2 and represent 13 years of released games from John Tiller during the period of 1999 to 2012. Though very well loved for the breadth of scenarios and depth of research, the games are in dire need of an update. 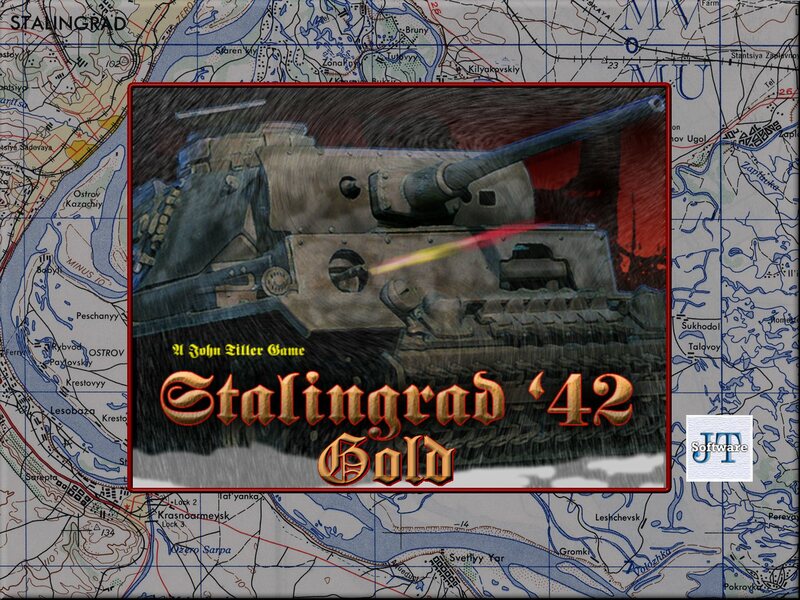 With that in mind we’re looking to release the ‘Gold Series’ for Panzer Campaigns. We’re yet to determine how these will come to market but I expect there to be a full version for sale via John Tiller’s site with possible broader distribution. We’re also looking at how to distribute the new games to existing owners, either via patch or as a complete new installation. For simplicity, we would prefer the later but need to discuss the mechanics with JTS. 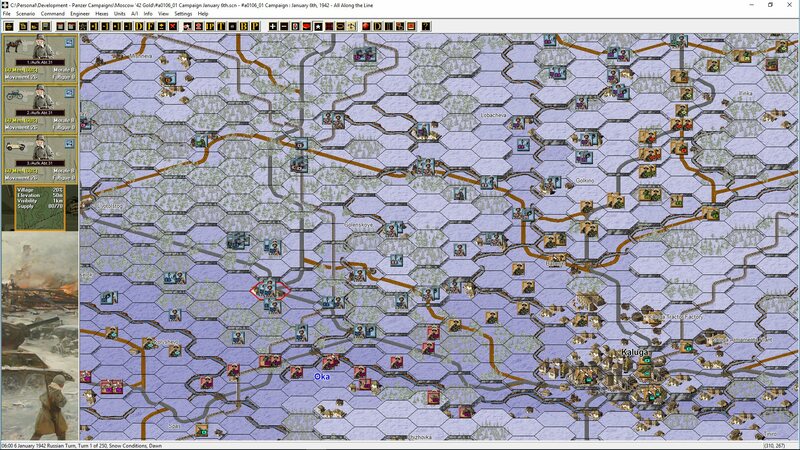 Currently, we have been focused on completing the Eastern Front games first. Seven of the eleven are done and work on the eighth is about to commence. The focus will swing to the other theatres after that. We have focused on theatres as it’s quicker to reuse graphics across associated titles. A lot of work has gone into revamping the 3D graphics. These were rarely used by players, but are certainly in a better state now. This is a big project and everything shown is work in process, but we wanted to share what had been done to date. The Panzer Campaign games are such a strong series that we wanted to put the time in and update them to be more aesthetically pleasing both graphically and aurally. 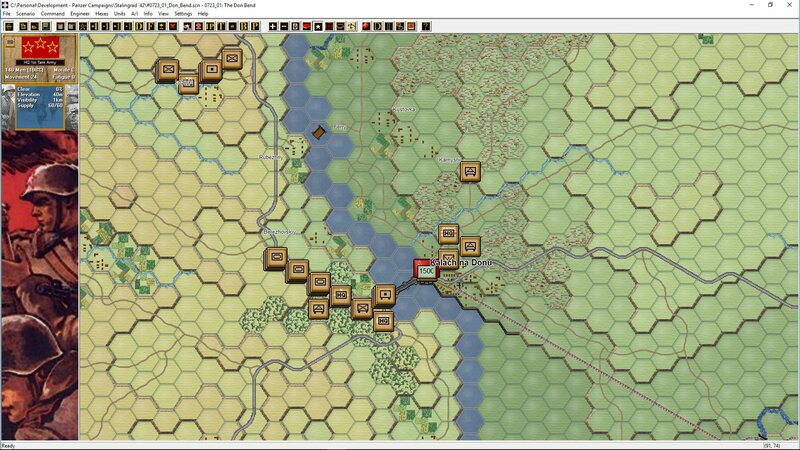 ← Panzer Battles Demo – Released! Great news people, it’s really great to hear this! But until you solve the biggest issue these games suffer, you won’t move that much forward towards their playability.. And this is again mainly about the Eastern front titles. I will create a post this weekend at the blitz to detaily describe what I mean, with all the evidence. Until this is solved, I’m considering these series playable for maybe 15-20%. And I believe that it hopefully won’t be such a problem to fix, as it is implemented in other series, the FWWC. What I’m talking about? No air attacks on bridges and some special stuff requiring a lot of new coding rather a cancelation of a single rule that breaks these great games, well most of them,into a some kind of shooter game with a map. The rule: Disrupted units have half their movement allowance. I’m playing these games for 10 years, played every main campaign for Rzhev, and I have to say, that despite there are few more issues that could be solved, but they are rather of design approach, this single built in rule simply destroys the game so much it becomes unplayable. Please, erase this rule/code. If there should be a single thing you will do with this update, let it be that one, otherwise we re just painting a new color on a broken machine. I will explain everything at the blitz this weekend, need to summarize stuff, screenshots etc. Lets take that Don Bend scenario you have up there. 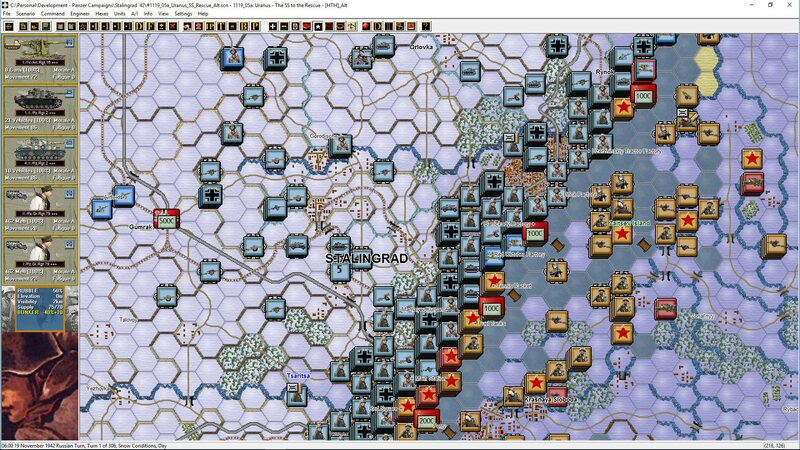 Man that one is absolutely unplayable, totaly no interesting tactical situations like the next scenario with soviet small pocket. Won’t happen, ever, until the sidruoted units are allowed to move normally. I am one of the persons working on the re-releasing of the PzC games… I for one didn’t understand very well what you refer to, other than there seems to be a problem with disrupted units not being as mobile as units in good order. Love your avatar 🙂 I know what Fhil is asking about. Currently units in the PzC lose half their movement points when disrupted. This is not the case in First World War Campaign series so it could be ported across if we get some programming resources. that would certainly change how the games play, in a pretty radical way. I love what you guys are doing! I’ve been using the panzer battles demo and think it improves an already great title. I’m wondering are you planning on upgrading any of the WW1 campaign titles? Also, when and where will the new projects be available? thanks for your hard work. 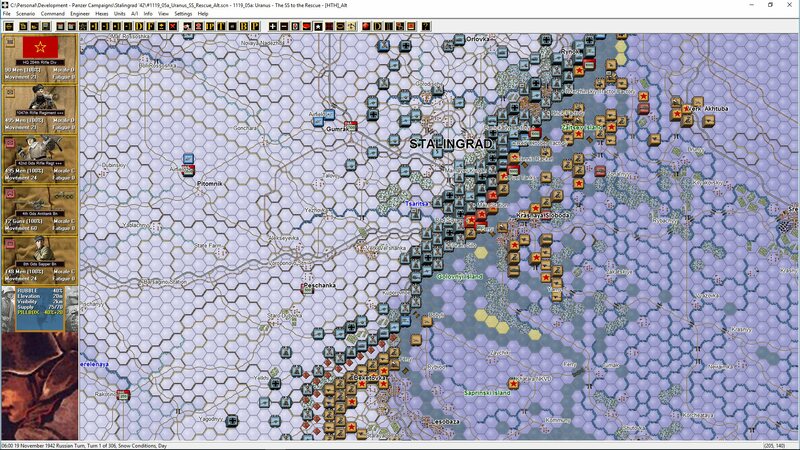 Currently we’re focused on Panzer Campaigns. First World War is Ed William’s baby and Jison has done some amazing work there and in my opinion does not require any rework. 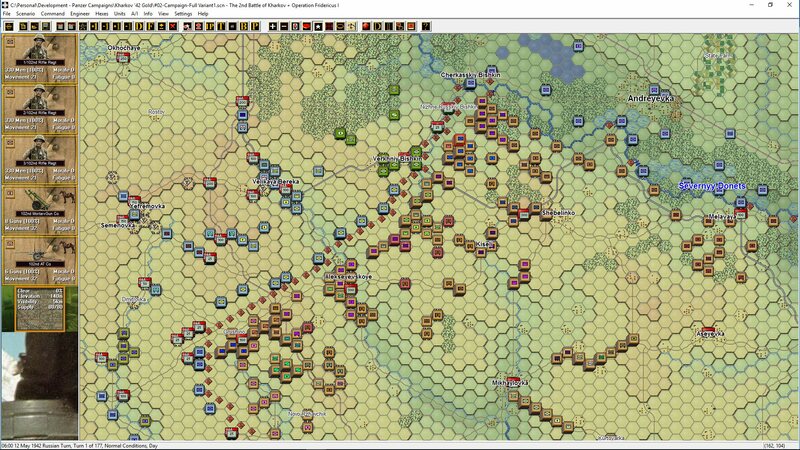 As for Modern Campaigns, again that is not on our current list as we would have a lot more work to do on unit graphics than in the Panzer Campaign series – maybe when we get some spare time…. Ah, I knew Volcano was on board but now I know where Jison has gone too. Makes a ton of sense! just what was needed. After a long break returned to PzC, and MC, and greatly enjoy them. But the above update is needed. Still keeping my fingers crossed that MC will not be ignored. It would be shame to abandon them. Love everything about the new graphics, David, EXCEPT those Jison-type hexes. I really can’t stand them and find them so ugly, cluttering and confusing that I wouldn’t play a game that looked like that. I mean it. I haven’t bothered to buy the FWW series because of the incorporation of this style. Will I be able to get rid of them? Will I be able to switch off hexes as you can now and not see those things? I doubt it, because you’ve gone and filled in the centres light so that even with hexes off all you see is hexes. It looks about as far from a natural map as you can get. I don’t think I’m alone. Many like hexes, many hate them. The old series at least let you switch them on and off as needed, so it was each to his own. I don’t know why you’ve gone and taken away that option. But given you have, will I at least be able to swap in the old terrain files – are they the same size? No hexside hexes are included – as mentioned previously. I have not shown them in the shots here. Also note, I had the standard Tiller hexsides on for all shots – so both the Jison like & Tiller hexsides can be removed. That’s a relief. Thanks, David. 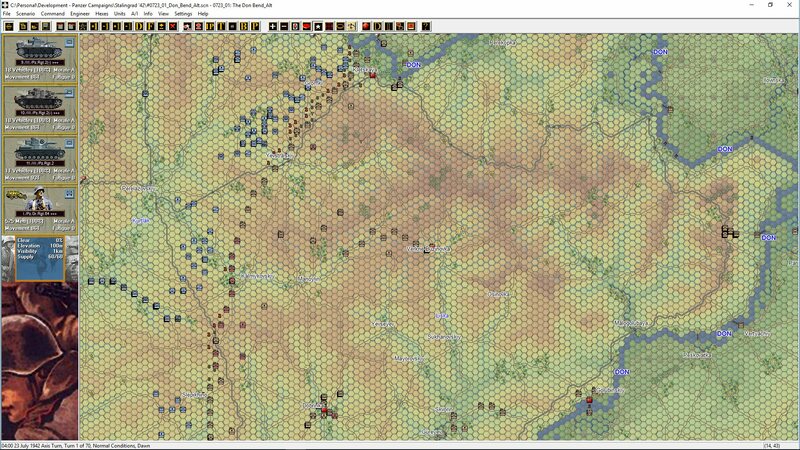 But, hexsides aside, aren’t the actual hexes (the terrain tiles) now coloured as per Jison’s – with each hex area having a kind of light patch in the middle which shows the terrain as a hex grid whether or not you’ve got the hex lines switched on, whether or not you’ve got the sides removed? That’s what it looks like above. 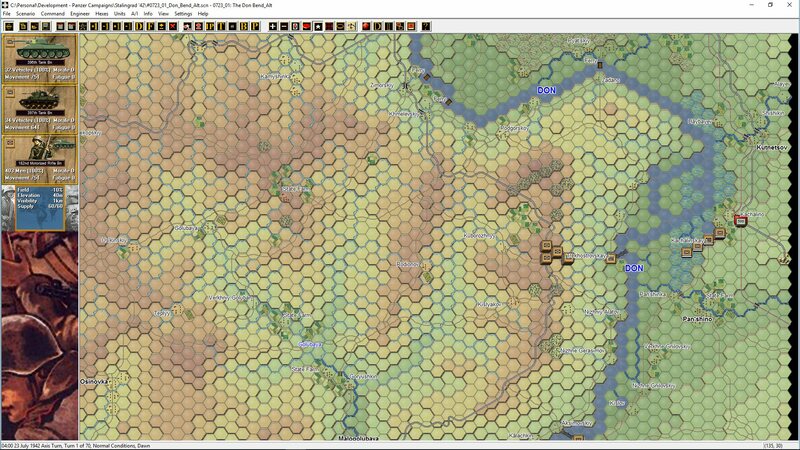 You asked about which hex design was preferred in the Blitz, I recall (I responded there) and I believe most people came out in favour of the least cluttered effect – which was, more or less, just plain colouring, no centre to the hex. But above it looks as if you have given a centre (a la Jison) to each hex, no? 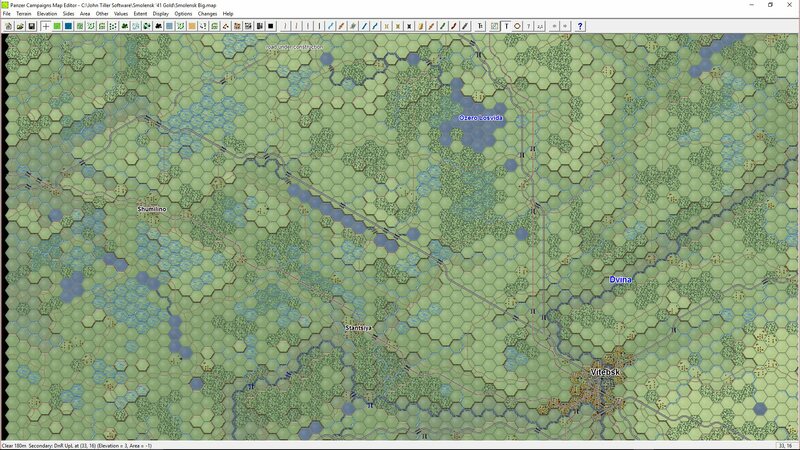 And, if so, are the files the same sixe as the old ones, and will I thus be able to swap the actual terrain tiles (not talking about hexsides here, just the actual normal, mud, snow etc terrain tiles) for the old ones? Thanks again. Aside from my hex thing, the graphics are a massive improvement. The towns are especially good, but I like the trees, villages, symbols too. Great stuff, provided I can get away from the hexy effect and have it looking more like a normal map. Please check the thread I posted at the Blitz. I think I allay your concerns there. Great job making the rivers look more natural too! Actually, when I look closely at the last 3 images, it may be that the light-hex-centre effect is very mild and it will look nice once the hexes are switched off. Great to see PzC getting some new life. Always been my favorite. This is great news. Glad to see! We’re working through all the options including pricing and discounting. As we’re refreshing the whole range there are a few different approaches that can be taken. We’ll announce more once we have decided what to do. That is nice to hear, since I discover PZ Campaigns I have been interested in having them all 🙂 I hope this will be possible, i will keep an eye on this. About discounts… i think a good idea could be do like Matrix and for every game you own receive a discount… maybe 1% to a max of 10-15% and another discount bonus if you buy a pack of titles… 5% for 2, 10% for 3 (15%+10% means you buy 4 titles by the price of 3)… with this rebuy some titles could be less painfull specially when like me i miss practically all when i move to a new home… at least i mantein the HD where i install all them. Well, lets see how is the resurrection of PzC even when i prefer see new titles to hehehe. Discounts? Have I misunderstood earlier comments, David? I thought that those of us who have already paid $40 per title would get these changes as previously – as a patch, for free? Is that not to be the case? Existing owners will receive these changes as a patch. They won’t be asked to buy the games again. Wonderful news. Looks and sounds great. And I own all the PC games and always come back to them, so I don’t even mind paying for updates to this series if required. Would not mind at all. The updates look like they will be worth it. Looking forward to the update release. Thanks. Finally found a link to the demo and downloaded. Enjoying the demo but cant open manual or help so its a bit difficult to progress or even buy a game. I think others have had the same problem from what I can see. There have been some issues due to over zealous filtering over at the John Tiller site. Either try accessing it from a different location/IP or reach out to Support@johntillersoftware.com and they should be able to assist you directly. Go the manual and help, do you have Adobe PDF reader installed on your system? I have PDF on my computer just the demo dosent seem to bring up anything? Found manual but the demo dosent bring them up or any help using F1 – F4 keys? I´m new to this site, but feel like sharing my opinion on PzC. I´ve been playing PzC for about 10 years now, and before that I used to play the PC game World af War Stalingrad and Operation Crusader. 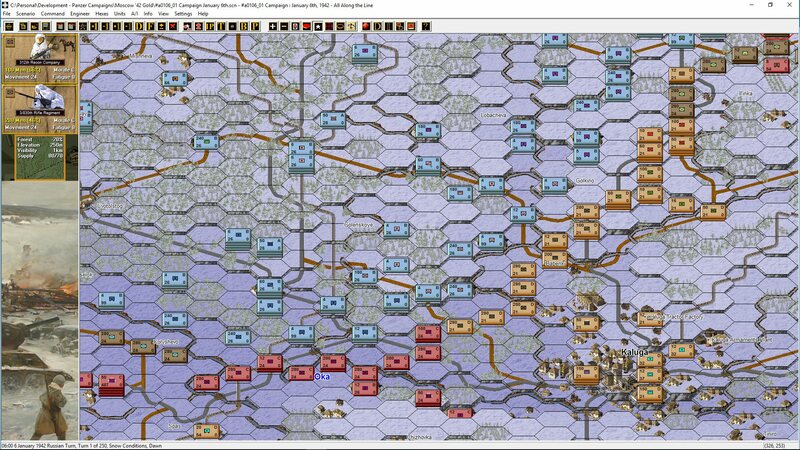 1) Lets face it – the AI divisional movement in PzC simply does not work. Make it work – or even better – just get rid of it. Instead you should add a feature where you can give open orders to individual units – just like in WaW. i.e. order a unit to go from A to B using a certain route, (use transportation mode here and tactical mode there). The unit will execute the orders over the next many turns, and report to you when they are done. The unit will only terminate its orders if contact with enemy units is established. 2) Like in WaW it should also be made possible to attach individual units to a divisional HQ. i.e. I want to attach a corp Nebelwerfer directly to a Panzer Division, but I cannot do that without attaching a bunch of other corp units at the same time. 3) Bunkers, pillboxes, trenches, etc, should have a certain defensive value when attacked frontally, but a reduced defensive value when attacked in the flank or from the rear. Anyway – a bunker´s defensive value should be reduced when hit a certain number of time by artillery or FLAK. Today bunkers have a fixed defensive value. a) Much to often the computer allows itself to be surrounded without trying too break out and return to its own lines. 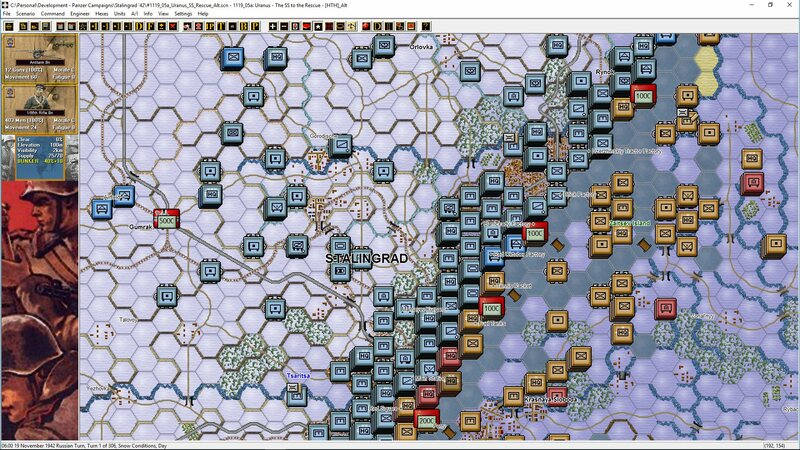 And units outside the encirclement ring don´t try to relieve their comrades. b) The Soviet artillery (which is formidable) is too passive – it should pound every German unit in the open in sight, but usually does nothing. 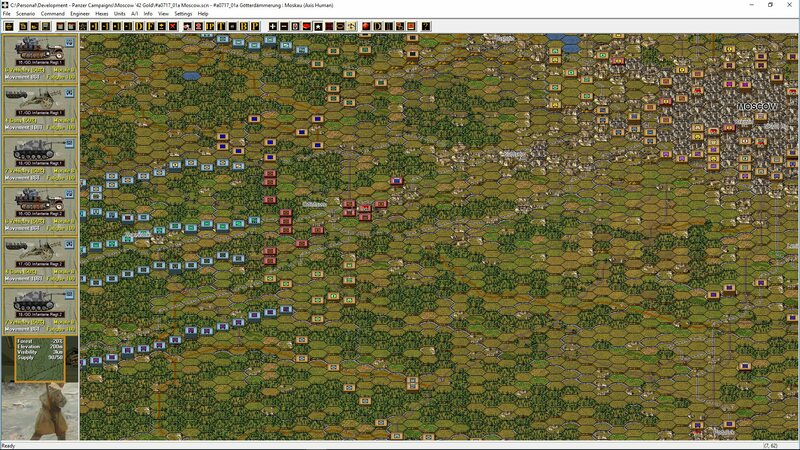 The artillery is also very easy to trick – a single shootout between two individual units will make the AI spend all the artillery firepower at once, after which I can start the main attack without being shelled. c) Partisans are much to passive. Most of the time they are just remaining in their starting positions, doing nothing. They should dig in along the roads and wait in ambush for the Germans – making it difficult for them to bring their reinforcements forward in time. d) In Moscow 42 some well entrenched soviet unit are leaving their bunkers for no reason at all – making them easy prey for my artillery. Air attacks and especially artillery in WW2 were not very good for destroying bridges. They were awkward targets and difficult to hit, and usually protected by flak. I remember reading somewhere about air attacks on a bridge somwhere which had hundreds of bombs from every imaginable type of aircraft dropped on it, all of which missed. This was fairly typical, it seems. The effectiveness of Red Army artillery in WW2 has been exaggerated by historians, to say the least. In reality it was largely limited to 1914-18 methods due to a lack of trained observers and severe communications shortcomings compared to other WW2 armies. This meant that Soviet indirect fire had to be carefully planned and targets plotted on the maps at least 24 hrs in advance. The batteries could not easily engage unexpected targets of opportunity on short notice because there were few trained forward observers with a stable signals link to the artillery. Things improved somewhat by 1945, but Soviet artillery methods remained slow and antiquated compared to the Wallies and Germans. This is why they employed a good percentage of their field artillery in a direct fire role. No offense guys but I don’t intend on buying the same games twice or paying for an upgrade or patch. Maybe I won’t have all the latest doodads with my games but I can still get hundreds on hours on enjoyment out of them without spending another dime. We expect there will be a free patch/upgrade for existing owners. We won’t be asking people to buy the games again. What I think people really crave after being in the blitz community for a while now and owning all the titles is…. New titles. People want the crimea, The berlin, The courland pocket, and so on. Well that’s my humble opinion anyhow. Still all good work tho. -More clear fog of war. Like PzB. -More intuitive mouse cursor. Sometimes it´s difficult to see. -An option to view/HQ on top. Similar to “leaders on top” in the Napoleonic series. -Contours, area boundaries and Labels settings auto-saved on game exit. -Divisional markings colors on the unit box. -A clic sound everytime a unit is selected. What is the latest for the PC’s updates…the last time we heard was 4 months ago. By the way, I love the updates as shown in Moscow 42. All is still being worked on. That said we’re on a time crunch trying to get another (new) title out and that is consuming more time than expected currently. I want everything done yesterday but there are only so many man hours in a week. That said, good progress is being made and we will make a call on release timing soon. Do not need nowhere to rush. The main thing is not the speed but the quality of the product. Its been 6 months since you claimed to have 7 of the eleven east front PC’s updated…still no release date? current status?…I was hoping to hear something more concrete by now…at least an estimated release date…should we give up hope for results this year? It would be nice to hear something before the holidays. I’ll take responsibility for the lack of news lately. The updates to PzC is one of three major projects underway of late. Unfortunately, it has not been our number one priority. We have put brand new content as taking precedence followed by updates to previously released titles. We do have new content coming but it’s unfortunately not for PzC. When I released this update we had not picked up the ACW work and the integration of that and the related team has been a bigger job than expected. Finally, I was hoping to get some programming resources to update some items. That has not been forthcoming to date and I now have a decision on whether to release as is (a graphics and scenario enhancement) or wait to see whether time becomes available. Thanks for you patience. 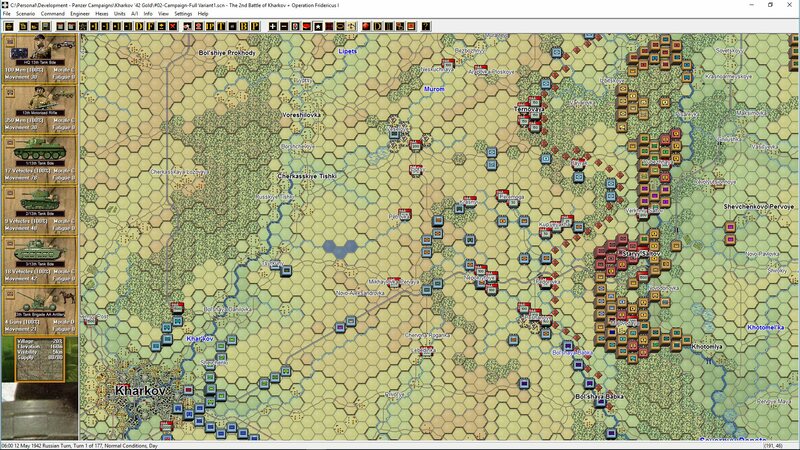 I hear you…sounds like a gold addition to the PzC’s will be some time next year, maybe?…in the meantime I vote for a release of the graphics and scenario enhancements now (for the ones that are ready), I have 9 east front and 7 other titles waiting for such an update. I believe this will placate those of us who have been more than anxious for the gold additions for now. Glad someone is not allowing this series to die. Have bought and played a few of the games. Though they take a while I felt like I was a part of history while playing them. Hope to see these re-released! would be great if there was one on the Finnish/Russian War, the Balkans and Greece. Its good to see some attention paid to ‘classic’ games. Many features or functions could use some attention, simply because games evolve. But, that said, there is ‘one’ thing that would be absolutely great to have. 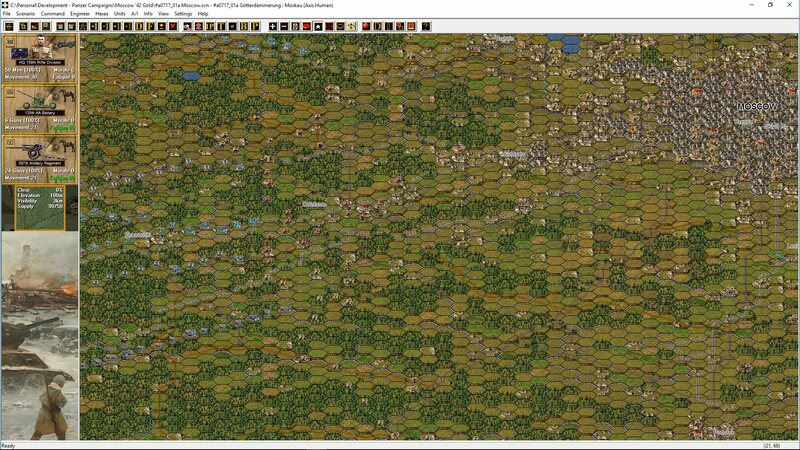 A full map-editor! One that would incorporate, scanned material too. It would require some programming commitment. But I for one would be willing to pay for such an add-on. The equivalent price of a current game would not be out of line, IMHO. I’ve done my own map variations, frustrating and fun at the same time. Also unit counters and the ‘cards’ have been modified. Some successfully, some not so much. The point is I like the ability to do this without having to ‘mess’ with any code related aspects. A map editor is an absolute must. I cannot fathom why HPS/Tiller refuse to provide one. The no-map-editor-policy seems to be based on the fearful notion that it would somehow discourage players from purchasing additional PzC titles. This does not hold up to scrutiny. In fact, I’ll bet the opposite is true; editors keep players interested in a game system/series because it allows endless possibilities for tinkering, experimenting and research which in no way devalues or undermines the work and research invested in the official titles. That research and map work are their main selling points to begin with. A mere map editor will never be a substitute or threat to that. 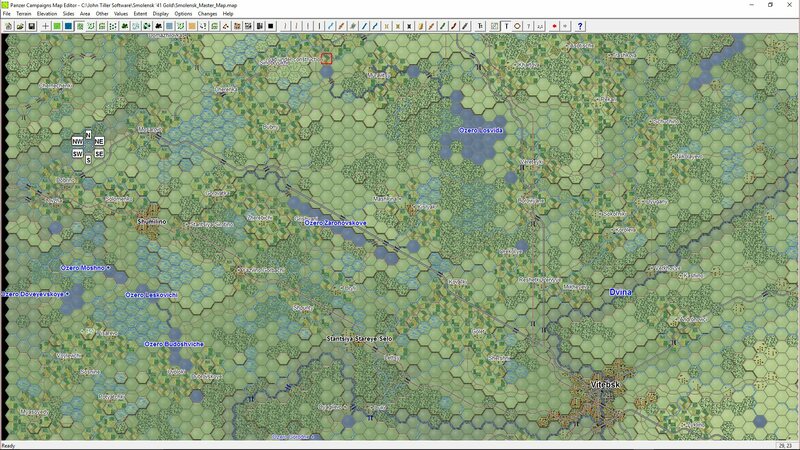 Wargamers have always loved to tinker with games, and providing a map editor keeps gamers interested. JTCS and TOAW; are still popular largely because they have full editors, which means gamers can always return to the game and try something new. the maps should have an…….on/off for hexes that really removes the hexes (the double line around the hex). 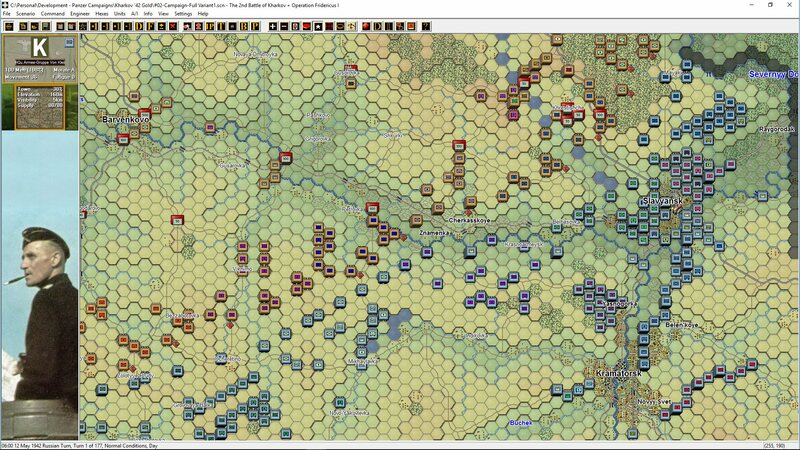 The Napoleonic and Civil War games from JTS give the maps a real map flavor. For those that want the hexes………there is an on/off. please incorporate this feature into an update. There is both a hex outlines on/off switch under settings that works just like the ACW & Napoleonic games. If you want to completely remove the double hex line, copy the contents of the ‘No Hex Outline’ directory under the Map directory into the Map directory. That will remove the hex side aesthetically. in my humble opinion……….that is a tremendous improvement. I owned literally only a couple of titles from the PC series but since I’ve learned of the JTS/WDS Gold modernization, I’ve purchased seven more from the series (plus Middle East ‘67 to complete my Modern Campaigns collection…fingers crossed these are updated in the near future). The visual updates are absolutely welcome and thank goodness the 3D map is not neglected. 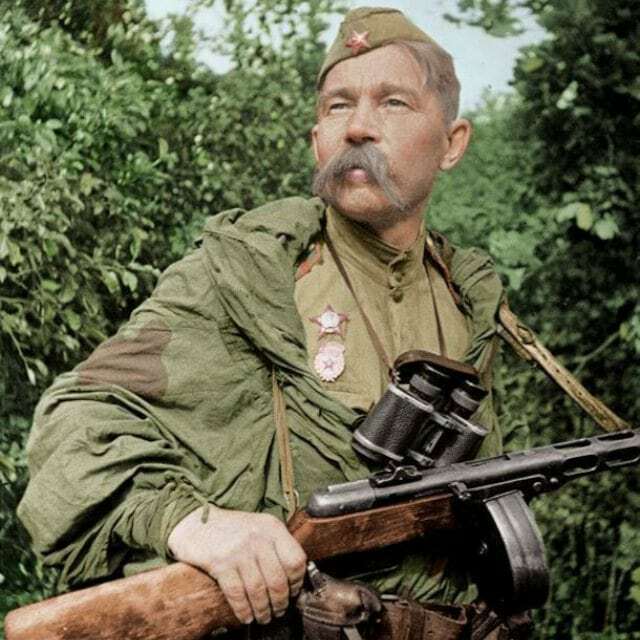 1) Are the unit portraits historical photos (and retouched to hi-def effect)? Or were new models used with very convincing uniforms and gear? 2) Would it be possible to slightly lower the ‘FIXED’ indicator so that it is not completely plastered over the portrait faces? Chest level would be great. 3) Are Designer Notes updated with Gold changes/info? 4) Were there changes made to the AI? Thank you for your time and effort into revamping this perfectly scaled series! Firstly, thank you so much for the support.You’re an example of what we hoped would happen post the updates. 1) Yes all photos are historical and usually colourised. Have a look through the blog posts and there is a dedicated post covering this process. 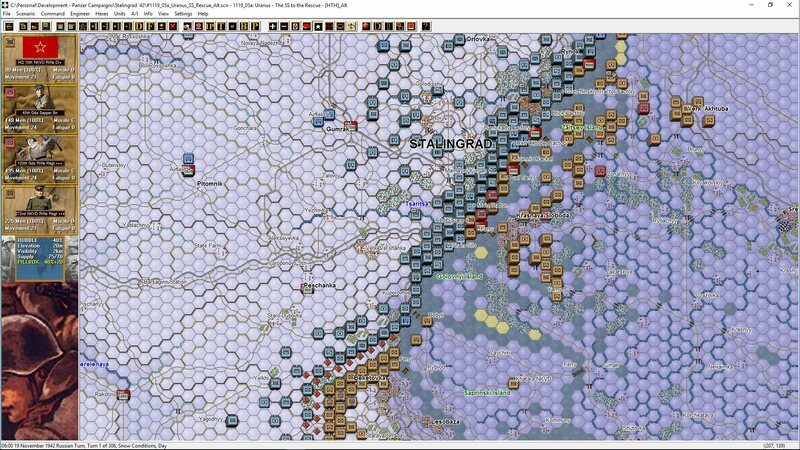 One of he ‘So you want to design a Wargame’ series. 2) Moving ‘Fixed’ and other indicators will be programmatic. I will have to see what is involved with John Tiller. No promises. 3) No, the designers notes aren’t updated but the Changes.txt is. 4) Not yet. We are starting to test AI changed in the Panzer Battles series and they may ultimately be ported to other series. AI is one of those very challenging areas to program where you will rarely satisy the majority of people. Thanks david. I’m going to retract my comment about the ‘FIXED’ position. My complaint was from my experience with original and modified portrait artwork. Upon closer inspection with a couple of Gold titles, I’ve realized that my complaint is pretty much addressed already; in Gold the portrait faces are elevated enough so that the ‘FIXED’ indicators are positioned just under the chin. Sorry about jumping the gun there.